The bells have been ringing for thirty minutes, but it is the sound of a cane rattling through the empty, cavernous church that suggests prayer. It is held by an old man, his stooped body covered in the flowing black habit of a Benedictine monk. He enters from the sacristy, clicking, clacking, up a barely perceptible incline. When he reaches the altar, he pauses and bows, then turns to the left and clicks and clacks his way upward to a lonely seat in the dark wooden choir. “And my mouth shall proclaim your praise,” follow the accumulated voices of the Benedictine monks, a soft morning thunder rolling out from the choir over the empty pews. A single note echoes from the pipe organ. The monks on the choir’s left side sing a verse from Psalms, their voices resonant and nearly undivided. After a pause, the monks on the right side sing a verse. The song continues, shifting back and forth across the choir in a sort of divine stereophonic effect, brothers singing to brothers singing, occasionally joining together on a verse, offering their voices to each other and to God. When the psalm ends, after the last organ note fades into an ethereal echo, there is a full minute of silence, a contemplation of the prayer just sung, the moment interrupted only by a sneeze, or the occasionally audible grumbling of a stomach. Then the psalms continue, the canticle comes, the responsorial rumbles. Morning Prayer lasts for roughly thirty minutes, depending on the day’s demands, before the monks shuffle silently from the church. They walk from the sacristy into the cloister, and then turn right into a wide hallway with tile floors and mostly bare walls, passing a lounge where several copies of the day’s Star Tribune have already been pulled apart. The procession continues, still silent, down a flight of stairs, into a darker hallway, past more lounges, past a massive floor-to-ceiling bulletin board covered with sign-up sheets for prayers, readings, haircuts, and kitchen duties, and then through two wooden doors into the abbey dining room. Pastel-colored religious paintings and stained-glass images of foliage hang from the wood-paneled walls. A beautifully carved wood podium stands ceremoniously in the middle of the space; a massive china cabinet dominates a far wall. Eggs, sausages and other dishes are served in chafing dishes on stout wooden tables. It is a very much an old room in style, and yet certain details—the harsh lights, the plastic dishes and trays, the Wheaties and other boxed cereals—suggest that practical updates and conveniences have been integrated. The brothers eat breakfast in silence. This has more or less been the morning routine since 1856, when a group of Benedictine monks from Pennsylvania arrived in St. Cloud to tend to the German Catholic population. In the 150 years since its establishment, St. John’s Abbey, located on 2,500 acres in Collegeville, ninety miles north of the Twin Cities, has exerted a profound influence on both the Catholic Church and the history of Minnesota. The liturgical reform movement responsible for English and other non-Latin masses received some of its most influential and eloquent support from monks at St. John’s, which is also home to a university and prep school. Minnesota Public Radio was launched within the Abbey’s cloisters (and Garrison Keillor’s first radio performances took place here). The abbey’s Liturgical Press remains one of the most important religious publishing houses in the world, printing journals and books that continue to influence both the scholarly and popular understanding of religion and spirituality. The community has counted among its ranks prominent historians, theologians, liturgists, artists, and philosophers. Nevertheless, St. John’s Abbey is undergoing the most dramatic changes in its history. For decades, it was the world’s largest Benedictine monastery, with more than four hundred monks living there at its peak in 1963. Today, it has 175, and their average age is sixty-five. The abbey’s traditional role as a provider of parish priests to Minnesota’s churches has become largely obsolete, its monks neither youthful enough nor sufficient in numbers to do the job. The large central Minnesota farm families that once provided the abbey with its most plentiful source of novitiates have been lost to changing rural demographics, leaving the abbey to compete with the temptations of big cities and non-religious careers. Most serious, the sexual-abuse scandals that erupted in America’s parishes also shook St. John’s, altering its culture, its image, and its relationship to Minnesota. Yet even through its darkest hour, the abbey has continued to find novices and retain members, who in turn find relevance in a Minnesota prayer community based on the writings of a sixth-century monk.“We read that monks should not drink wine at all, but since the monks of our day cannot be convinced of this, let us at least agree to drink moderately, and not to the point of excess. Born around the year 480 in Norcia, a village in Italy’s Umbria province, the young Benedict rejected the noble Roman lifestyle of his family, retreating instead to a cave for a hermit’s life of prayer. Yet the cave could not shelter him from those impressed by his holy example. Among the visitors were monks from a nearby monastery in need of a new abbot. Benedict tried to refuse the job, warning them that his strict approach to monasticism would not harmonize with theirs. It was an accurate prophecy. As the new abbot, Benedict “watched carefully over the religious spirit of his monks and would not tolerate any of their previous disobedience,” recounts his hagiographer. The monks chafed at this rigidity and, shortly after installing Benedict as their abbot, tried to kill him. With the help of a minor miracle, Benedict survived the attempt on his life. His Rule, a diminutive book of less than a hundred pages in English translation, bears the hard lessons of that experience. Still, for all of its humane flexibility, the Rule has its rules, and they can be specific: Monks are to sleep in dorms lit by a single lantern that burns all night; they are to sleep in their habits, girded with belts (“but they should remove their knives, lest they accidentally cut themselves in their sleep”). Most important, the Rule sets out a particular cycle of prayer—or divine office—requiring eight communal sessions per day. Yet St. John’s, like other American Benedictine monasteries, has consolidated the cycle. According to Father Columba Stewart, a monk at St. John’s and an internationally renowned historian of monasticism, “virtually nobody follows the Rule exactly.” Other departures include private rooms for monks, and the absence of lanterns. Thus, the Benedictines at St. John’s have been accused of worldliness—continuing a tradition nearly as old as the Benedictine order itself. Indeed, the Cistercian order was created to reform the Benedictines, and the Trappists were formed to reform the Cistercians. In both reformed orders, life is far more regimented, prayer is more frequent, and silence is more common. Instead, what is found is the ordinary and the routine, performed and lived in moderation and community. At St. John’s, prayer occurs each weekday at seven a.m., noon, and seven p.m. A mass is held at five p.m. During the day, some members take the time to engage in lectio divina—holy reading—a practice recommended by Benedict whereby a monk spends a portion of the day in deep, prayerful reading of a text. In between, some work at jobs in and out of St. John’s University and prep school (unless they are retired); others attend universities elsewhere or serve in positions around the country and the globe. No matter where they might be living, all monks remain connected to their home community at St. John’s by order, communication, and love; they return when called by their abbot, upon retirement, or when the difficulty of being away from home simply draws them back. Obviously, a layman outside of the abbey can live with many of these trappings. But doing so within a community, led by an abbot, is what makes monastic life distinctive. Abbot John Klassen has a wood-paneled office with large windows that look out on the gardens surrounding the abbey’s church. A visitor will most often find him working at his desk, his lanky, six-foot body bent in a tight angle as he concentrates. Once interrupted, however, he unwinds and relaxes to the point where his adjustable chair threatens to tumble backwards. The Rule devotes a considerable amount of space to detailing the abbot’s responsibilities. None is more chilling than the blunt reminder that “Whatever the number of brothers he has in his care, let him realize that on Judgment Day he will surely have to submit a reckoning to the Lord for all their souls—and his own as well.” When I asked Abbot John whether, in fact, he believed that he had that awesome responsibility, he answered, “There’s no ducking it.” He leans forward when he speaks, his voice deep and full of wide central-Minnesota vowels, his manner one of pure enthusiasm. Father J.P. Earls, Abbot John’s freshman English teacher, says, “I wouldn’t have picked him as a future abbot. He always struck me as just a big German farm kid.” But the truth is that Abbot John, at fifty-five, is an intellectually intense man, an organic chemist with a Ph.D., and a teacher of renown. Elected by his brothers in 2000, his gregariousness and honesty have not only guided the monastery through difficult times, but also caused concern that he will be tapped for a leadership position outside of St. John’s Abbey. “You do it in fear and trembling,” Abbot John says of his job. “But you do it in faith as well.” He presides over a complicated and unruly place. “You are an order without order,” was one of the more notorious complaints leveled at the abbey in its history. Yet St. John’s is not unique in frustrating traditional church authority. Like most monastic orders, it does not answer to the traditional diocesan church hierarchy except in particular circumstances, the most important being liturgy. It is, in fact, outside of that hierarchy, and instead answers to federations and authorities in Rome. “At one time we were a monastery that took in students,” explains one of the monks. “Now we are an abbey in a university.” St. John’s, in fact, is the largest private university in Minnesota, an operating division of the Order of St. Benedict, Inc., run by the abbot—legally, the university’s CEO. In a sense, the university and prep school are mature family businesses in which members of the abbey own an interest and work, some as academics, and some as support staff. However, the abbot’s worldly enterprises don’t end there. They also include the Liturgical Press publishing house; a sustainably managed forest that feeds the abbey’s carpentry shop; a bakery that produces thousands of loaves of branded St. John’s bread per week; and the demands of a rapidly aging population of monks. “At the end of the day, you turn it over to God and say, ‘It’s yours for the next seven hours,’” sighs St. John’s implacable abbot. Father Columba Stewart is forty-six years old and wears faded black jeans and a faded purple sweatshirt torn at the collarbone. His manner is intellectually confident, but softened by an easy smile and a knack for patient explanation. He looks and acts like the academic he is—a well-regarded historian—but he is first and foremost a member of the St. John’s community, and he speaks of it in the same way a man would speak of a stable marriage. “Like any intimate relationship, it changes you. It forces you to ground yourself,” he says, relaxing in a chair in the abbot’s lounge, a small window-lit room that contains books, a medieval image of Benedict and his sister Scholastica silk-screened onto the wall, and a cookie jar. “I’ve never thought of it as giving something up. I’ve always thought of it as gaining.” Stewart’s is a uniquely contemporary approach to entering monastic life, based on a choice that he made after having already begun a career while a graduate student at Yale. 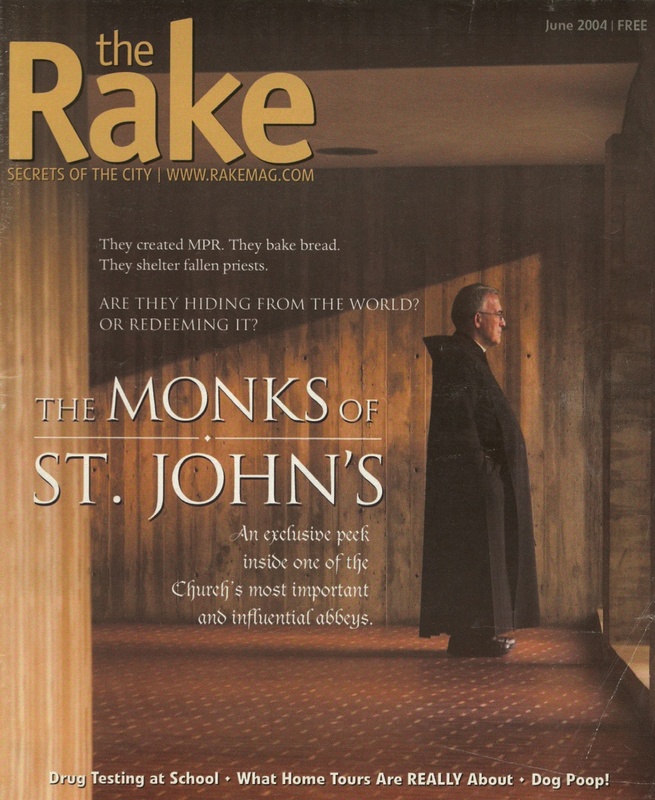 “I’d met some monks from St. John’s,” he says by way of explanation, with a simple shrug. In decades past, the abbey did not recruit so much as receive eager novitiates in their teens and twenties, who were often sent to St. John’s Prep School by large farm families. The notion of “marriage” to a prayer community—especially as a choice to be made from among other careers or paths—was foreign to most of them; the monastery was their sole option, arranged by their families. On Saturday morning, his habit whispers across the floor of a corridor on the second floor of the abbey’s residence. He passes a lounge that once served as an overflow dormitory for young novitiates. “There used to be ninety of us in our twenties on this floor,” he says, then turns right, into another lounge now dominated by a television. Passing through it into a long, empty room filled with tables and chairs, Skudlarek stops. “This is the old rec room. Used to be, we would line up outside for bridge in the evenings.” He glances out the window at Lake Sagatagan, the silence of the room enveloping his warm voice. On Saturdays, evening prayers are different from the rest of the week. Monks enter the church in pairs, stop at the altar, bow to the crucifix, then turn away from each other and take seats on opposite sides of the choir. As the first hymn is sung, a monk spoons incense into a bowl placed in front of the altar. It begins to burn and the smoke rises in a curl around the white crucifix. The monks, so accustomed to focusing on the crucifix during the silent interval between prayers, now trace the path of the smoke. As they sing to one another, and then to God, the smoke unfurls across the baldachin. The psalms and canticles continue and the smoke spreads through the church, defining the shafts of light cast from recessed bulbs in the ceiling. The voices in the choir seem more forceful than usual, perhaps inspired by the additional majesty conjured from light and smoke. Yet it is only at the end of the session, after Father Thole has read from the Bible, after psalms, canticles, hymns, and several intervals of silence, that the sweetness of the incense, having risen, descends on the monks. It’s an identifiable pattern: Today, Niebauer himself receives an inquiry from an aspiring monk approximately every thirty-six hours; the seekers range “from high school kids to the incarcerated.” Those who appear serious and suitable, and who are between the ages of twenty-three and forty, are invited to spend short intervals over a period of two years visiting the abbey. “It’s not for everybody,” Niebauer cautions with a wry smile, but those who like the life apply for a three-month candidacy during which they live, work, and pray at the monastery. The abbey is as careful as many employers about who will be invited to spend his life in the community. Before the candidacy, aspiring monks submit to state and federal background checks and a credit check. During the candidacy their physical and psychological health is evaluated. Those who pass the checks, complete the candidacy, and wish to continue apply for a one-year novitiate. It has become a select group: The 2003 “class” comprised two men. Luft, a Des Moines native, came to St. John’s as a college student. “Last year I received a Christmas card from my college girlfriend and her husband,” he smiles. “That was weird. I thought, man, I’m thirty years old. There was this realization that she was the last person that I would know.” According to Luft, the two-year relationship ended amicably with both parties headed in different career directions. She was interested in management and corporate life; he in teaching and the seminary. There wasn’t much middle ground. Yet as the scandal progressed, there was still the question of what to do with accused members of the community who wanted to remain at St. John’s. “People were saying, ‘You’ve got to throw these guys out,” Abbot John recalls. “But we felt that we needed to find meaningful work and lives for those who wanted to stay.” So monks or priests who chose to remain were placed on restriction in the abbey, prohibited from associating with staff and students of the university and prep school, and prevented from using almost all public facilities at St. John’s. Everybody always says they wish they had my job,” says Father Timothy Backous, St. John’s athletic director. “Except for the Benedictine part.” He laughs, his eyes narrowing into a nearly wrinkle-free squint. He wears a polo shirt and neatly pressed khakis. The walls of his office, just down the hall from that of John Gagliardi, St. John’s legendary football coach, are covered with photos of athletes, sporting events, and award certificates. Scattered among them are a simple wooden crucifix, icons, and a Ph.D. diploma in Moral Theology earned in Rome. One of the great mysteries of monastic life is its ability to confer youth upon its practitioners. At St. John’s, most brothers appear ten to twenty years younger than their ages recorded in the abbey’s register. Yet as the aged know, youth is not only a matter of appearances. At the abbey, careers often remain active, fruitful, and vital into the eighth decade of life. Opinions vary as to the reasons for this phenomenon. Some cite the stress-free routine of monastic life, its lack of mortgage payments, car payments, and job pressures. Yet others, particularly brothers who have academic careers, scoff at the notion that a cycle of prayer and meals is enough to keep life stress-free. While many brothers cite the lack of family pressures, it’s just as easy to find those who reject that explanation and note that cohabiting with roughly two hundred “guys” can be rough. Late on a Saturday afternoon, Father Angelo Zankl, the abbey’s oldest member, is seated in his wheelchair in the retirement wing, home to twenty members of the community. His 103-year-old face is thin, but his wide eyes are clear and bright, and his delicate, almost feminine lips are raised in a perpetual smile. He is good-humored, whip-smart, and not shy about teasing Father Skudlarek, who sits beside him, or the two nurses at the reception desk. Nevertheless, Father Zankl is a private man, and he is unwilling to comment for publication on the circumstances of his life at St. John’s. It can only be noted that he arrived at the abbey at age eleven in a horse and buggy, and that he spent most of his monastic career ministering to a Duluth parish. “That’s right,” Father Zankl says, his tone flat enough to suggest that he is only half joking.